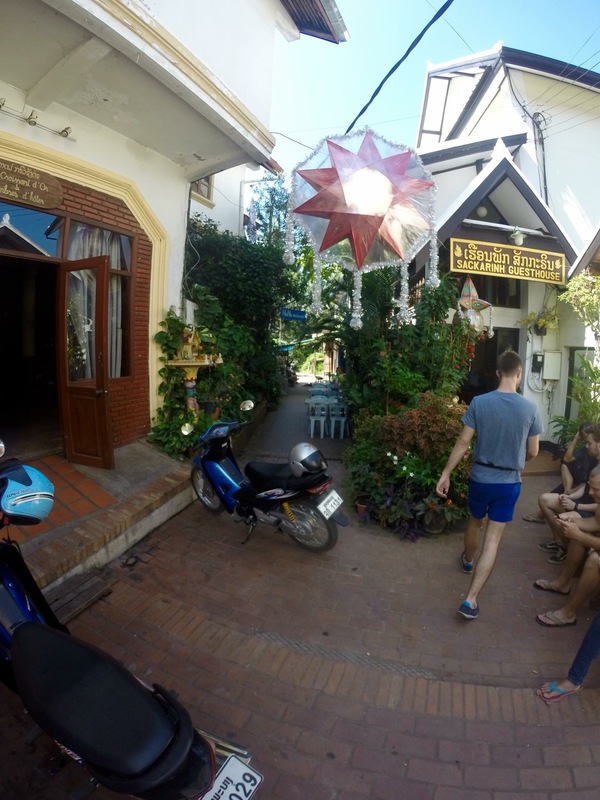 We arrived off the long boat in Luang Prabang and followed a lonely planet recommendation for a guesthouse in the centre of town called Sackarinh Guest House! It was located down a side alley within walking distance to almost everything, we were located outside the main market which runs every night from dusk til 10pm. By this point we had visited so many markets in Thailand they become very similar. There were a few bits and bobs different from Thailand but it was mostly the same tat, tribal trousers, magnets and souvenirs. Although Conor did buy some Laos Whisky from a lady, he bought one normal whisky and one sweet. The whisky was in an old M150 (glass energy) bottle wrapped in bamboo! 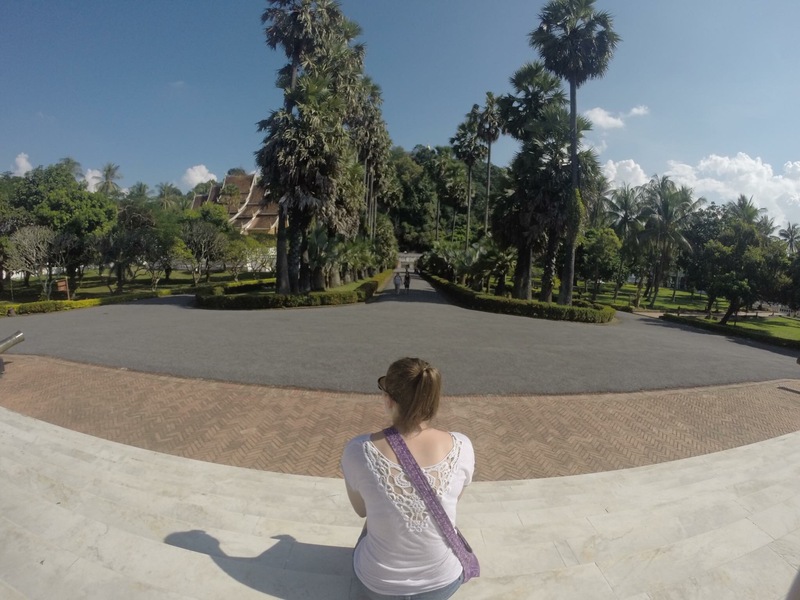 On our first day in Luang Prabang we visited the famous royal palace museum which was located just behind the market. The grounds of the palace were lovely and well kept, there were gardeners seeing to the flowers. We entered the building but were sent back to cover or shoulders and knees, we had to rent trousers and a scarf which was kind of annoying. It didn’t take long to go around the palace museum, there’s lots of artefacts and the rooms where the royal family used to live however it’s not very extravagant. After visiting the museum we decided to rent bikes for the day which cost less than a pound and we could keep them overnight, it was the only place in town to rent bikes were you didn’t have to leave your passports. 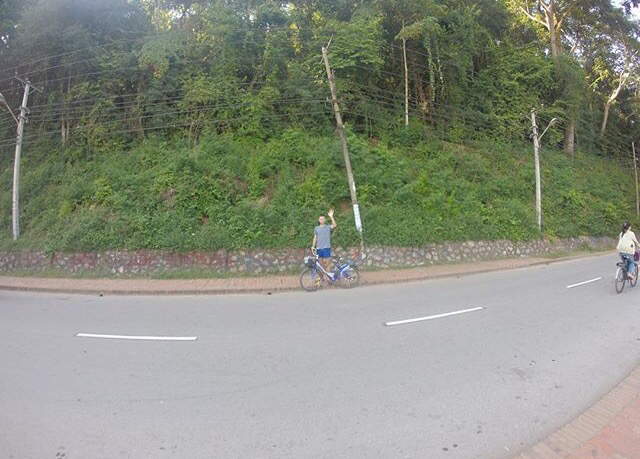 We cycled along the Mekong river, the roads were completely different to any Thai city, there was minimal traffic so it made it a great destination for cycling! After cycling around the town and following the river we decided to visit the well known bar in Luang Prabang called Utopia! This is the best place to relax in Luang Prabang with reclining cushions located high above the river side you can read a book and listen to the sounds around. We headed back to utopia on our second day and joined in the yoga class. Neither Conor or I have ever done yoga but it was really fun. There was a class of about 15 people ranging from beginners to advanced. I strategically located myself at the back of the class. As the class began with the instructor saying now let’s say hum three times, Conor and I both looked at each other and wondered what we’d got ourselves into. As the class progressed it was actually really fun and really difficult. I thought I’d never sweat so much on the jungle trek in Chiang Mai but it might have been equal doing yoga in 30 degrees. On our final day we visited the temple of the hill, we hiked up the 300 steps to the top but the view was worth it. 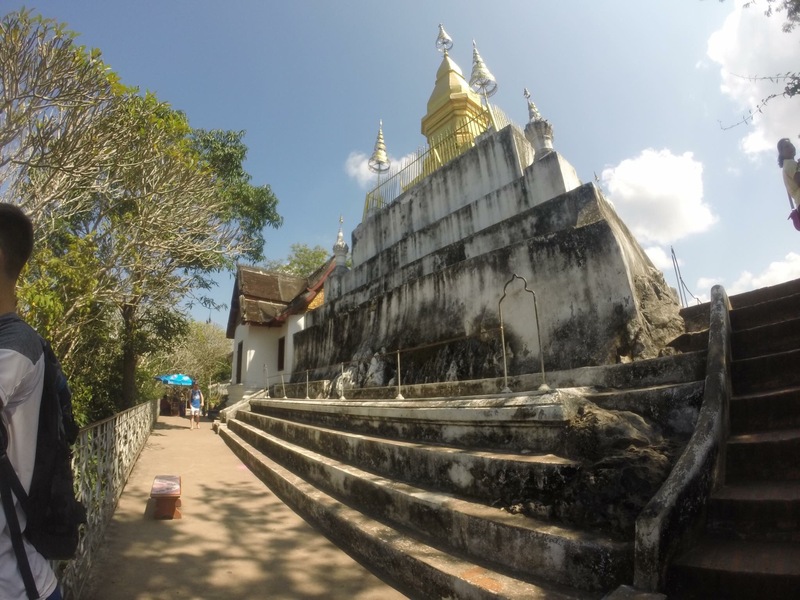 A temple located on the top of the hill overlooking the Mekong river and Luang Prabang city. 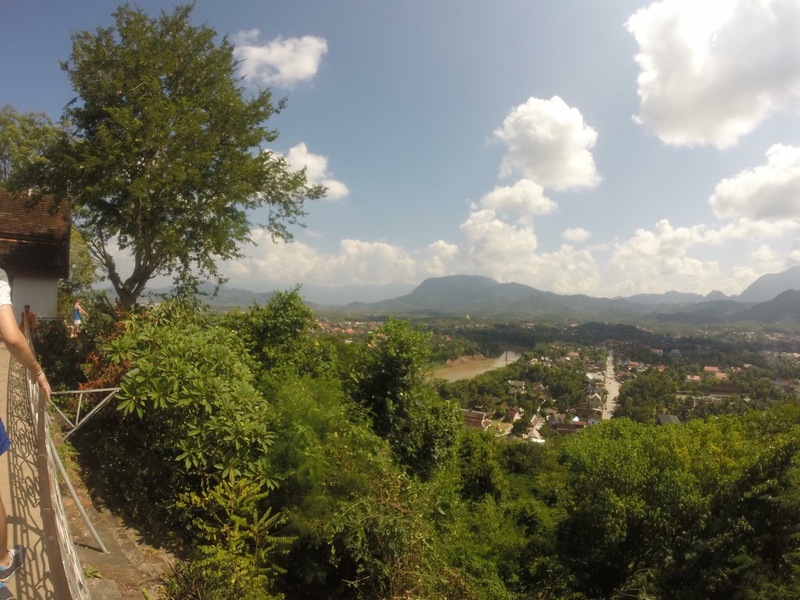 We soaked in the views at the top and then made our descent down the opposite side of the hill passing more smaller temples, a large gold statue of Buddha and a shrine in a cave. As we stood taking pictures of the Buddha two young monks, about the same age as us approached us asking where we were from and how we liked Laos, they then asked whether they could take pictures with us! 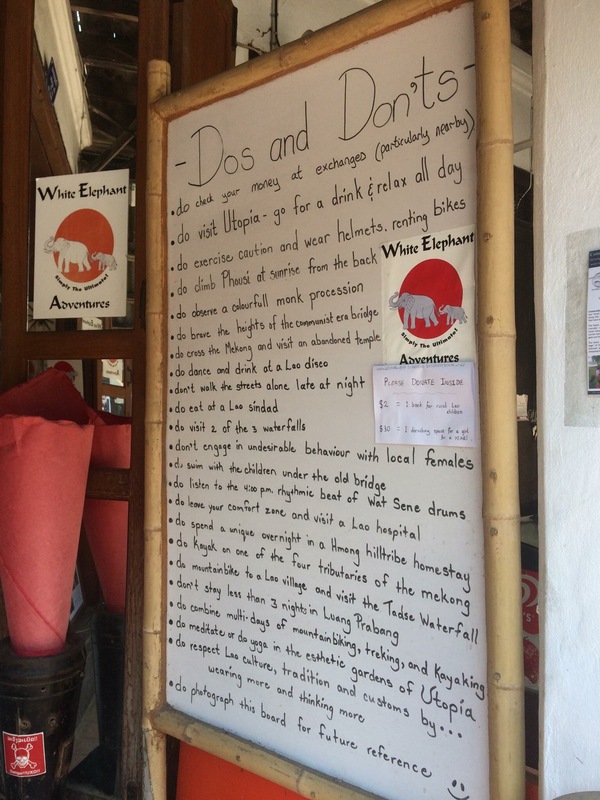 I really enjoyed Luang Prabang, it had a really chilled vibe and had a great cafe culture. We visited a lovely cafe in the centre of town called novelty cafe serving great savoury croissant and cakes! We also visited a lovely tapas bar in the centre of town one night called La Casa Lao, the food was amazing and great service!